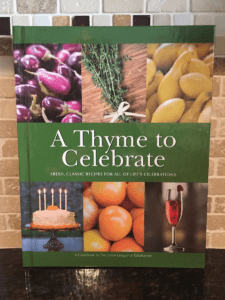 A Thyme to Celebrate is a cookbook published by the Junior League of Tallahassee. This book includes over 220 recipes from categories such as entrées, sides, desserts, soups and salads, brunch and more. A Thyme to Celebrate includes tidbits of information about the Tallahassee community. Additionally you will find sidebars that describe “thyme” saving techniques in the kitchen, ways to lighten up your meal and wine pairings. Sprinkle the chicken with salt and lemon pepper. Dredge in flour to coat. Brown the chicken in olive oil in a skillet. Remove to paper towels to drain. Sauté the scallions and bell pepper in the drippings in the skillet. Add the artichoke hearts and mushrooms. Add 1 cup of the chicken stock and the tomatoes. Arrange the chicken in a 3-quart baking dish. Pour the vegetable mixture over the chicken. Sprinkle with the parsley. Bake, covered with foil, for 40 to 50 minutes or until the chicken is cooked through. Prepare the rice using the package directions, substitute chicken stock for the water.